A memorable family holiday usually is the result of parents planning ahead and making sure the destination has lots to do. Most kids love to hear about what they can look forward to on any given day during a holiday, so putting together a list of kid-friendly activities and attractions ahead of arrival is a key component to any holiday planning for parents. We know how many things there are are to do in Byron Bay for families—from the obvious beach time, to both water and land must-dos, the list can get pretty long. So we thought we’d help out with a few ideas for the land-based side of things with some ideas on great hikes, walking paths and even wandering around activities. Check the end of the post for links to some other blogs that might provide even more ideas for your family holiday plans! Capturing a family photo with the famous Cape Byron Lighthouse in the background or standing at the sign that says this is the “most eastern point in Australia” is a must-do for every family holiday. If your kids are old enough and not in strollers, we highly recommend doing the whole loop, which is 3.7 km and will take about two hours at a leisurely pace. But due to the many amazing 360 views of the area you’ll get along the way, it’s well worth it. Plus, there’s always the bribe of ice cream to get your kids to come on the walk—stop at the Lighthouse Cafe (please note it is cash only and there’s no ATM, so plan ahead! ), where you’ll find gelato and snacks, or The Pass Cafe to fuel everyone during the walk. The beaches of Byron Bay are gorgeous and worthy of the fame they have in Australia and even the world. Main Beach is one of the best for families with life saving on patrol during the high season, a short stroll from the centre of town and some of the best surfing in the area, it’s hard to beat. And even if you aren’t looking to get in the water, taking a stroll on the beautiful beach with the kids and ending up at the excellent park, just off the beach, Apex Park at the end would make for a very rewarding morning or afternoon during your holiday. Although, we’d recommend checking out the many other excellent beaches in Byron Bay too, such as Cosy Corner, The Pass and White’s Beach. If your kids love the magic of fairies, then you’ll need to put the Brunswick Heads Fairy Trail on your list for your family holiday. Around Brunswick Heads, there are a number of little fairy houses tucked into various locations, not in obvious places, but rather in fun, surprising places. 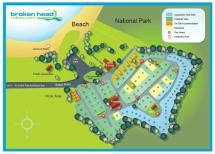 To follow the houses, you can obtain a clue sheet either at the Brunswick Heads Visitors Centre or download it directly. An anonymous “fairy grandmother” maintains the houses along the fairy trail, so be sure to let her know if you see anything that needs repairs along the way (0428 284 030). Right in the backyard of Broken Head Holiday Park is the Broken Head Nature Reserve where you’ll find the Three Sisters Walking Track. A quick 1.6km return will offer you and your family gorgeous views of both the beach and the hinterland, as well as a chance to view migrating whales if it’s during season. Plan to bring along food and either eat at the nice picnic area or on the beach. Tallow Creek Parkway is short, easy walk (or even bike ride if you brought them along or decide to hire) for kids. Starting from Suffolk Park, this track is mainly flat pathway until you reach the Tallow Creek bridge. If you hang out on the bridge, you and the kids will probably notice quite a few birds hanging around, which is due to the fact that Tallow Creek is zoned as “Special Purpose” for protection, rehabilitation and indigenous use. After the bridge, you’ll follow the pathway to the signs for Arakwal National Park on Broken Head Road. Along the parkway, you’ll find that there are a number of beach entrances in case you want to stop for a swim or brought along a picnic. Experience something a little off the beaten path when you and your family visit the Crystal Castle and Shambhala Gardens. Here you can take the Shambhala Gardens Tour, enjoy the free “Crystal Castle Peace Experience” or check out the Enchanted Cave, the largest amethyst cave ever discovered, which is approximately 5.5 metres wide and has a weight of more than 20,000 kg. Between the gems, statues and gardens, the whole family should feel at one with nature and be able to get in a zen mindset! A scenic walk along the coast, the Lennox Head Boardwalk will offer the family amazing views from both Lennox Point and Pat Morton Lookout. You can start either at the end of the Dress Circle Road or further up towards Lennox town centre at the end of Rutherford Street (you’ll see a car park, beach access, a picnic table and swing set). This stroller-friendly hike changes from a boardwalk to a pathway leads to the Pat Morton Lookout where you can look for dolphins and whales (during season) as well as watch for hang gliders. The kids will enjoy wandering the stalls of the markets in Byron Bay just as much as you will. You never know when you might run into some live music that will allow the kids to get their groove on. Plus, you’ll like the fact you can find an awesome array of fresh produce. The Byron Bay Farmers Market takes place every Thursday from 8 to 11 am at the the Butler Street Reserve. The first Sunday of every month you’ll also find the Byron Bay Community Market, also at the Butler Street Reserve, open from 8 am to 3 pm. This market offers everything from jewellery, to homewares. Depending on the age of your kids, Boggy Creek Walk provides a much easier hike than the nearby Minyon Falls walking loop. Located within Whian Whian State Conservation Area, this walking track is a popular one, but if you happen to visit during the off season then you might have it all to yourselves. The walk is 2km one way and runs through the rainforest between Rummery Park and Minyon Falls, which means either end would be a good spot for a break. Take note that the pools near the creek section are excellent places to take a quick dip if its a warm day. Offering a pretty stroll through endangered littoral rainforest to the mouth of the Brunswick River, Boggy Creek Walk is the perfect short hike that will give your family some off-the-beach time. This walk usually takes about 30 minutes to complete, depending on the size of your legs, and is an excellent place to observe birds. Be on the lookout for the rainbow bee-eater. Named so because these brightly coloured birds are immune to the sting so they actually eat bees! Normally you’ll see these birds during the warmer times of the year. Since it’s such a short hike, it’s an ideal time to pack up lunch and enjoy your food at the nearby Brunswick River picnic area. After a family hike or activity, the kids will be ready to relax and spread out so consider Broken Head Holiday Park to use as a home base during your holiday. You’ll enjoy knowing the family is spending some quiet time away from the town centre, and the kids will love sleeping out under the stars (or at least, the idea of it, no matter if you’re in a tent, RV or one of our beach cabins or beach shacks). Our facilities are perfect for families with kids of any age, so check out our accommodation and start planning your next family holiday to Byron Bay now!